Earthling, is a satire of spectacle. It makes mincemeat of the torrent of information and imagery that we consume (and that consumes us). It reconfigures global media subjectivities. It resists. It reprograms. It ruffles my casual disregard for the everyday onslaught of the headline. The book is about the size of a National Enquirer supermarket tabloid and is just as juicy—a banquet of full-bleed spreads. Fronted by a ruminative short essay by Barry Schwabsky and a lovingly casual but sharp-as-a-tack interview between Neidich and Hans Ulrich Obrist, the book is throughout illustrated by several installation shots of Neidich’s previous work and drawings. The photographs are real-life representations of his particular perspective on media and consumption. 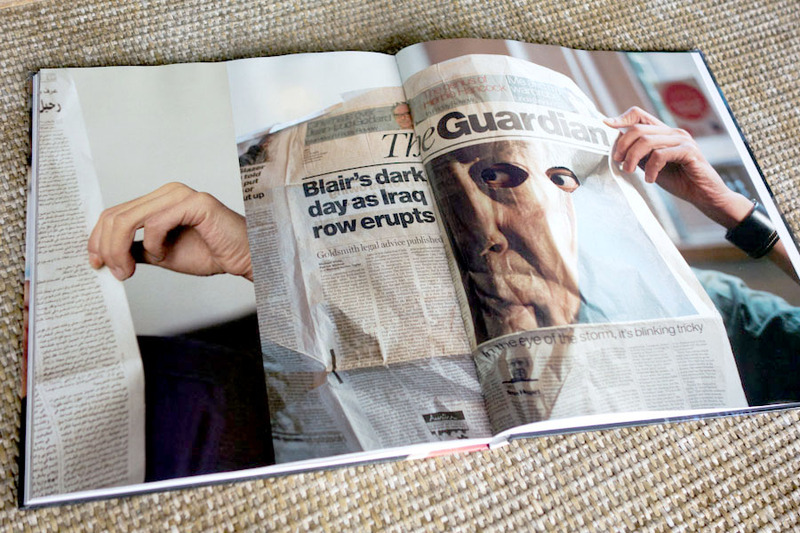 Each photo is a rich, somewhat high-contrast, colorful composition of someone reading in a café, obscured by their respective newspaper or magazine: National Enquirer, International Herald Tribune, Interview, The Guardian, Newsweek, Daily Mirror. Roughly-cut holes in what they are reading reveal their eyes, looking out, sometimes up, sometimes over, and, most ominously, right at the camera.